Arranging a car hire in Mombasa is much like doing it any place else when you are traveling. Getting a car hire in Mombasa certainly allows you the greatest level of access and freedom to explore the city and the countryside. But if you are planning to visit just one or two safari parks, it may be cheaper and less hassle to go with an organized tour. A small car will run you around 6000 Kenyan shilling, and it will be another 2000 Ksh for a 4-wheel drive (a requirement for entrance to several national parks). For that kind of cost, you should get a couple hundred miles of driving thrown in. Ask if you're not sure. More miles used means more cost when you return your car. So if you're planning on taking your car on a safari across half of Kenya, you might want to negotiate a price for extra mileage at the start. The insurance is an extra 1000 Ksh per day on average, and you shouldn't consider renting without it. You're liable for the cost of the car should something happen. Be prepared to leave a good-sized deposit as well. Also ask the company what the policies in case of major breakdowns are. Some companies may pick you up and give you another car, while others say that you’re responsible for getting the car repaired, after which your costs may be refunded. And always make sure the tank is filled up before returning the car, or the company will fill it up against higher petrol rates. As is the custom with Kenyan car hire companies, the prices quoted above are excluding 16% VAT (value added tax). Just for reference, 1000 Kenyan shillings is about $14 in American dollars. 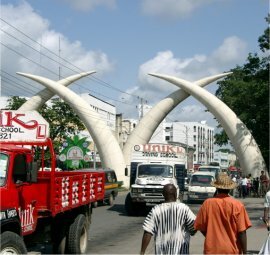 Some companies that offer car hire in Mombasa also have drivers available for hire, too. It's not very expensive. You lose your personal freedom and a bit of privacy, but the additional advantage is you are no longer responsible for the car and won't have to pay the insurance fees. And a local driver knows his way around better than you. Make sure you are eligible for a car hire in Mombasa before you arrange your vacation to have one. Depending on the company, you will need to be at least 23 years of age and in possession of a valid drivers license (for at least 2 years). The car should also be licensed as a passenger service vehicle (PSV), so check this at the car hire company. The car should also have a PSV sticker behind the windscreen. In Kenya, the police has routine checkpoints all the time. So better stick to the rules. There are several reasonably well car hire companies in Kenya, but my favorite one is Africa Point. This friendly Nairobi travel agency has a lot of choice in cars, reasonable policies and fair prices. Fixed pick up points are Mombasa, Nairobi and Kisumu but it’s also possible to have your car delivered elsewhere in Kenya. As you can also book other items in your travel itinerary with them, you might be able to get a discount for a package.